Federal Member for Gippsland Darren Chester, pictured at Namestone Point between Bruthen and Ensay, drove the Great Alpine Road recently to see progress on the $10 million project to boost safety and accessibility as work nears the half-way mark. 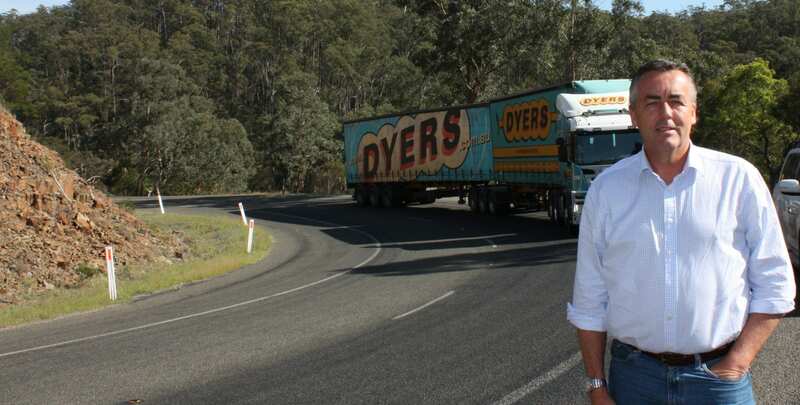 The Federal Member for Gippsland Darren Chester has travelled the Great Alpine Road from Bruthen to Cobungra as the $10 million road project to boost safety and accessibility nears the half-way mark. Mr Chester drove along the road recently to see the improvements made so far. “These roadworks are designed to boost safety both for locals who know the road well and visitors who may be travelling along it for the first time,” Mr Chester said. “New shoulders have been built and surfacing work has been completed along several sections of the road between Bruthen and Ensay and between Swifts Creek and Omeo. The funding for the Great Alpine Road project was announced in October 2017, with work beginning soon after at Tambo Crossing. “I’m focused on delivering for Gippslanders. By working together, we have secured government funding to improve our roads that will save lives and support local jobs,” Mr Chester said. “These works are critical to communities in the Tambo Valley such as Omeo, Benambra, Ensay and Swifts Creek, as well as tourists and freight operators travelling through the Victorian Alps to Victoria’s north-east and further north towards Sydney. • sealing of slow vehicle pullover areas and ambulance bays at six locations. The Federal and State government are jointly funding the Great Alpine Road improvements between Cobungra and Bruthen. The works are due to be finished in 2021. Mr Chester also secured $25 million from the Federal Government to improve safety along the Princes Highway east of Bairnsdale.